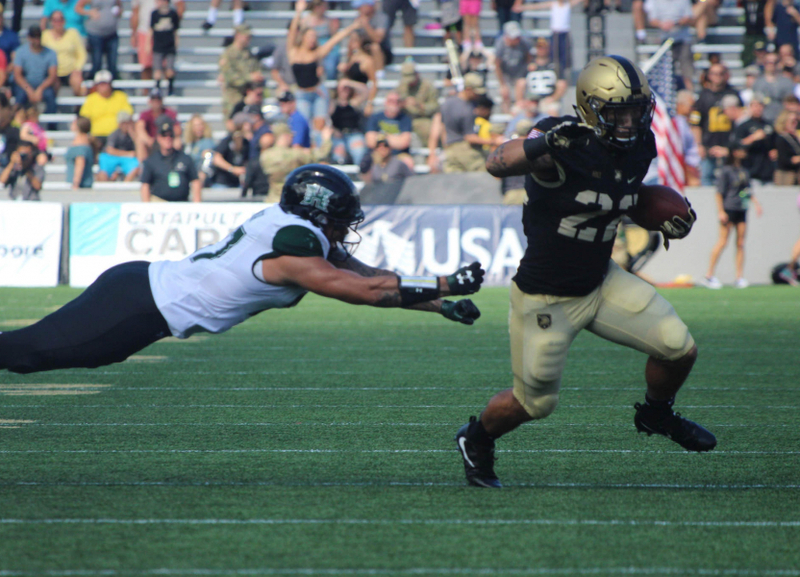 The Cadets were back at Michie Stadium this weekend and have now won nine straight games at home! The Rainbow Warriors were 3-0 coming into this game, including thrashing Navy like a docked boat during Florence to the tune of 59 points. Starting the season undefeated for the first time since 2007, Hawai’i entered the game ranked fourth nationally in passing offense (391.0 ypg) and fifteenth in scoring offense (48.3 ppg). The boys from the island were receiving votes for the top 25 last week in large part due to the return of the run and shoot offense, an effective system used from 1999 to 2011 including a 12-0 regular season in 2007. Although we didn’t do a preview article, I had the Cadets winning in a high scoring contest. What I couldn’t figure out was why Vegas had the Black Knights as 6.5 point favorites and ESPN gave us over an 80% probability of winning? 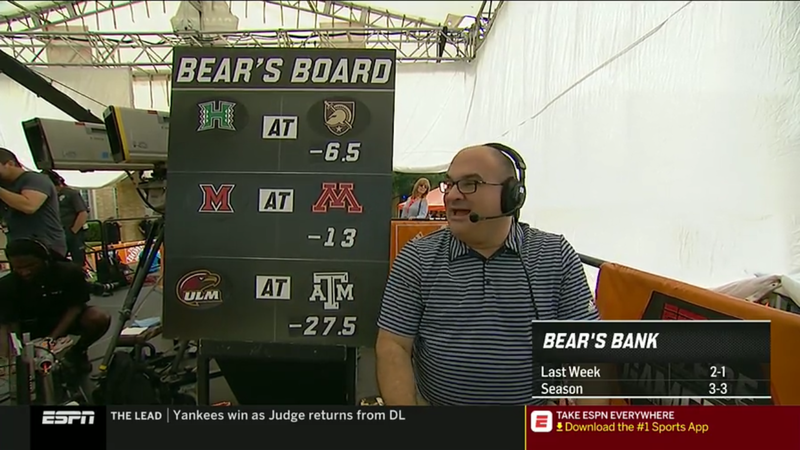 Nevertheless, the bookies were exactly right and covering the spread helped Chris Fallica (“The Bear”) go at least 1-2 for the weekend on ESPN Gameday. 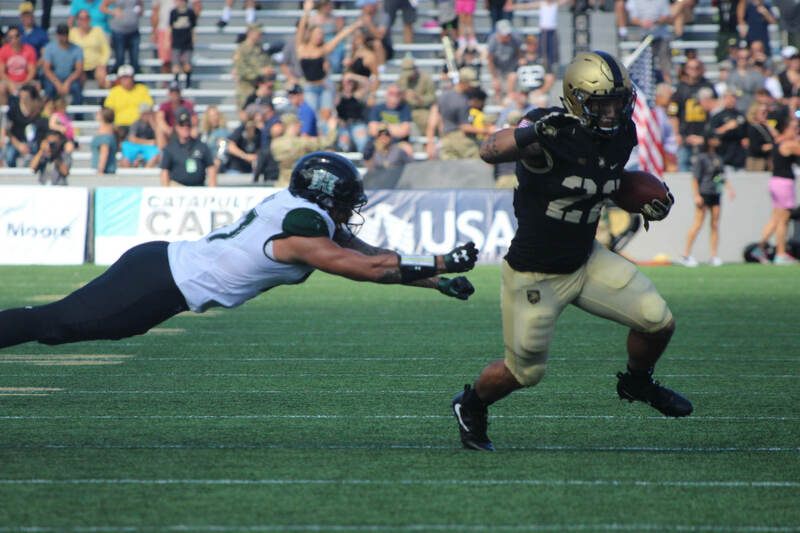 The Army West Point Black Knight Cadets of the Hudson offense looked strong again after accumulating 465 total yards including 303 rushing yards. The cadets are now ranked sixth nationally in rushing yards/game and ahead of all other triple option teams in passing yards/game (Navy, Air Force, Georgia Tech, and Southern Georgia). Like last week, penalties hurt us again as we lost 45 yards due to the new cut block rule. If you didn’t read our article last week or see the Petition circulating on social media, please consider signing it to help us get this rule removed! Big thanks to Colonel Daniel Ragsdale (“The Crazy Colonel”) for disseminating the petition to rally the Army Faithful! Ok… so this is the third week in a row that the defense is getting a unit award, but they deserve it! I am not surprised that we have leaned heavy on the defense so far this season since we returned 8 of 11 starters from last year. The Bad Boys led by Coordinator Jay Bateman held Hawai’i’s high-powered offense, which came into the game averaging 48.3 points, to just 21 on Saturday. The game almost got out of hand early as Hawai’i scored on their first drive and almost went up 14-0 early in the first. The defense quickly stiffened and forced the Rainbow Warriors to give the ball up on seven of their next nine possessions. Enjoy the Elevator Priveleges and stay off those legs! To most Cadets this would seem like a punishment, but you are a different breed. Top of the 2019 Class with a 3.9 grade point average as a chemical engineering major…I commend you. Bartlett Hall got all it could out of me during core Chemistry and Physics. The best thing about the building was the “experiments” that instructors would conduct before Friday Home games. You single handedly broke through 3 defenders to sack the quarterback on 4th and 5 during a three man rush. Acknowledging your achievement and your quest to earn the Campbell Trophy, you are now enrolled in Jefferson Hall Speed Reading. This should be an easy A+ and the Dean has agreed to make it 3.0 credit hours instead of 0.5. Winning this game with your family present was probably reward enough, but because of your game changing catch in the first quarter and raw emotion we are recommending that your first duty station is back in your home state of Hawai’i. Keep up the high level of play and we will continue to lobby for this post assignment. Congratulations on the engagement as well! Last week we took away your water privileges, but I guess that wasn’t enough since you still called three 15-yard illegal blocking penalties on us. This ended three of our four second half drives. Luckily we were still able to win, but sooner of later this is going to cost us a game. Worst of all, two of the three calls were wrong. I’m certainly not the smartest guy in the room, but I read the rule book and two of the blocks met all the criteria to be legal. They were directed from the front between the 10 o’clock and 2 o’clock, within 5 yards of the line of scrimmage, not towards the original position of the ball, and not towards our end line (the last penalty in the 4th quarter by our center Bryce Holland was towards the Army end line). To help you increase your knowledge you are hereby mandated a Washington Hall study session this Thursday. No Spirt Dinner and No Elevator Usage. Also consider this your Approach for Clarification. Next time you break the Honor Code, I will give you 24 hours! You must sign this petition in order to be released Thursday night. Camden you just earned a positive COR against Duke and now you went ahead and held on Kelvin’s 73 yard touchdown run at the beginning of the fourth quarter. We ultimately ended up scoring on the drive and burned a lot of time of the clock, but C’mon Man! As for the Army Field Goal Unit, how many Field Goals are we going to have blocked this year? You just got all you can eat PB & J last week, but you have quickly lost that privilege. This field goal didn’t end up determining the outcome, but in a game very soon it will. Remember #Buffalo2016…C’mon man! Captain American…I mean Cole…you already look like Steve Rodgers, but we still have to reward you for the game sealing pass deflection. Although most surface level reporters were quick to give you all the credit, I saw that my man James Nachtigal was also ready to Intercept the final pass. The look on James’ face after you tipped the ball away was the same look on mine when I returned from Spring Break to find out that my IT305 partners had already completed the database project…surprise, joy, and a little disappointment. Although my partners gave me very low participation grade (and by low I mean 0%), I still got an A- since they were very smart. Rest assured that no matter how much you help on your next project, you will get equal credit. Big win for the Army Team against a respectable opponent possessing a dynamic passing offense and familiarity with the triple option (Navy, Week 2). The offense is rolling while giving some aerial candy to all those “I wish Army passed more” fans out there. The defense is swarming, playing fast and smart. Special teams…well…there’s room for improvement. Despite the misapplication of the new cut block rule, Army has built solid momentum going into Norman, OK this Saturday. They will need it as they face the No. 5 team in the nation. This has the makings of a trap game for the Sooners who may look on toward larger opponents in the weeks to come. Regardless, this is the level Army needs to challenge themselves with every season. Time to be the optimist. Never underestimate the triple option. Never tell me the FPI odds. Believe in Army Football!